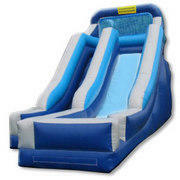 The 18ft Inflatable Slide is a single lane slide unit with front side easy climb access to a protective No-Jump area at the top of the slide. This big slide is bound to keep kids entertained for hours or adults for that matter. This unit can also be rented with the optional pool attachment that can filled with our FUNBALLS for an extra excitement factor.